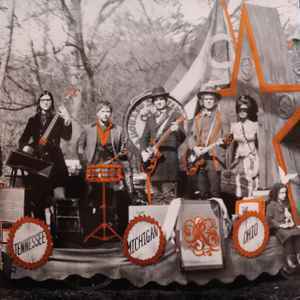 Published By – House Of Dreams Music, Ltd.
Third Man Records Vault 38 – 10th anniversary re-issue of The Raconteurs' Consolers of the Lonely, packaged with a 7" featuring two new songs. Also includes, 4"x4" Copper and Black "R" Insignia embroidered patch and a set of four 2.5" Brushed Silver stickers featuring art from Consolers of the Lonely. Fantastic pressing. A little afraid until the first listen as some of other isssues from TMR aren't fabulous. This one is. should the single have its own entry? other vault package singles do. Pretty looking pressing, and neat that TMR has reissued this. But the original smokes it terms of sound quality. It's a night and day difference, even on a modest system. The original is one of the best sounding modern rock LP's I've ever had the pleasure to own (along with Icky Thump). This one lacks the bass, realism, and depth of the original. The cymbals sound cold and sterile. Take "Salute Your Solution" for example. Jack White's voice shimmers through the gritty opening verse on the original. You can hear the sawdust in his vocal take! On the new one, it sounds congested and processed. Overall this new one is vastly inferior. Stick with Kevin Grey's amazing original cut! Awesome pressing and reissue. So glad I signed up for this vault package! If anyone is interested in selling just the patch, let me know.